One of the most frequently asked questions on this site is what dosage of vitamin supplements should one take to address MTHFR mutations. The answer to that is as individual as each of us but there are some guidelines put forth by notable practitioners in the field. In today’s guest post Kiki Kish* explores some of these approaches to give you a starting point. Remember that we are not doctors and the information contained in this post is for informational purposes only – you should always check with a doctor or licensed medical practitioner before beginning any sort of supplement regimen. Supplementing for MTHFR defects requires some research as to approaches as well as some trial and error. One size does not fit all. I liken the right protocol to a favorite family recipe – everyone seems to have their own version that’s the best because they tweaked it over time. It’s the same way with various approaches to supplementing for MTHFR. Learn about them, tweak them to suit you and then perhaps tweak them again as your metabolism changes, conditions improve or as you learn more about other contributing deficiencies. I’m providing an overview of some approaches for supplementing MTHFR and some comments on common nutritional deficiencies that may have a bearing on your MTHFR protocol. MTHFR.net is a good and well-recognized resource of information for MTHFR defects based on Dr. Ben Lynch’s extensive experience. Dr. Lynch provides a protocol for the MTHFR defect C677T here and while he doesn’t also indicate an approach for 1298C, you can assume the protocol is the same. His general recommendation for starting out is to start with B12 for several days at low dosages, and start adding MTHF folate at a ratio that is half the amount of B12, increasing every several days until you feel better or reach the point of overmethylation symptoms. He also notes that MTHFR is not just about folate and suggests a number of other supplements (some of which you can buy on his site) as well as lifestyle recommendations that would benefit anyone. Dr. Lynch is not a fan of large doses of MTHF folate and certainly not a fan of any dose without the accompaniment of B12 among other nutrients and minerals. Like many families including mine, Dr. Lynch’s family of five all have different MTHFR defects, but he says none of them take more than 400mcg of folate per day. Accompanied by double the amount of B12, that is probably a good base recommendation for people without many health concerns who have MTHFR defects. This is similar to the basic recommendation that my local center for integrative medicine recommends of 500mcg of folate and 1mg of B12 daily for anyone with the defects. My previous post provided direction on how to get a number of useful reports from your 23andMe genetic data including Dr. Yasko’s Methylation Pathway Analysis (MPA). The MPA provides a good discussion of methylation, the impact of various SNPs as well as a suggested supplement protocol based on your individual genetics. If you haven’t had your genome mapped yet, you can still access Dr. Yasko’s Simplified Protocol right on the knowyourgenetics home page. Her protocol addresses methylation by first laying groundwork before starting B12 and folate supplementation. The six steps of the protocol include 1) balancing certain supplements including a multi and B complex, 2) providing other shortcut support that supports detox as toxic loads can interfere with methylation protocols 3) balancing lithium levels, 4) determining your ideal form of B12, 5) Implementing the remainder of long route support which includes titrating the amount of MTHF folate you need via drops and 6) additional support based on your particular nutrigenomic profile. One part of her recommendations that is very important is the type of B12 that is best for you based on two particular genes, COMT and VDR Taq. This table is duplicated below. 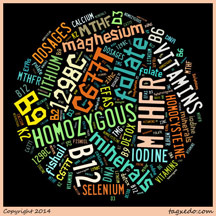 When I first started supplementing for MTHFR, I did not pay much attention to the type of B12. Once I found this table, I tried the recommended combination and it made a big difference for me and also for my husband (COMT – -, VDR Taq ++). His recommended type of B12 is the top line of the table. I further tweaked his B12 as he seemed to do best with adenosyl and methyl. So while I’ve seen sites that have recommended that people try different types of B12 to see which works best, I’m a proponent of this table as a starting point and really appreciate the work that Dr. Yasko and colleagues put in to develop it. The right type B12 is as important as folate. In fact, a B12 deficiency alone can cause a variety of conditions and ailments that can be as serious as the conditions attributed to MTHFR defects. For this reason, many feel the supplementation of pharmaceuticals (medical foods) like Deplin and others in high amounts without recommending associated B12 or other cofactors is a real mistake that can make many symptoms worse rather than helping. Just a bit more about B12. There are four forms, the three mentioned in the table above as well as cyanocobalamin. Cyano has to convert to hydroxyl before it can be converted to the methyl and adenosyl forms that the body can use (these forms are sometimes referred to as B12 coenzymes). Hydroxy is supposed to have a longer half life than any other form and adenosyl is the only form stored by the liver. One of the generally understood problems of MTHFR defects is that they cause high homocysteine. Homocysteine (Hcy) is a naturally occurring amino acid that is produced as part of the methylation cycle and is an important indicator of how efficiently you are methylating. High Hcy is implicated as a factor that can cause many serious problems from heart disease to Alzheimers. Dr. Brady, author of The H Factor Solution recommends a number of supplements that work synergistically with dosages based on Hcy values shown in the table below. He believes that your Hcy level is the best indication of whether the B vitamins are doing their job as opposed to checking B12 or B6 levels for example. When I first had my husband’s Hcy measured, it was in the very high risk category at 17.4 (and that was after supplementing him for several months with folate and B12). Four months later, after following a combination of these three approaches, it’s at 11.1. And while there is conflicting research as to whether lowering homocysteine correspondingly lower the risk of heart disease, Alzheimers, etc, he feels a lot better and I anticipate continuing improvement. The methylation cycle has four key steps that change homocysteine into methionine, methionine into SAMe, and then SAMe back to homocysteine that needs a methyl donor so that it can start the cycle over again. The enzymes that facilitate this metabolic process need the cofactors B6, B12 and folate, the active forms of B vitamins. TMG, also known as betaine, is an important methyl donor and is included in all the protocols discussed here. Many people may be deficient in betaine due to metal toxicity, inflammation and stress. Dr. Brady considers TMG as the best (and most cost-effective) way to generate SAMe in the body, which he calls the “master tuner”. SAMe helps make or activate important neurotransmitters that can help with mood, chronic pain and food cravings. Interestingly, TMG is an FDA-approved treatment for a rare genetic condition (CBS deficiency) that causes high homocysteine because it “methylates” homocysteine, removing it from circulation. Note that while most other approaches recommend double the amount of B12 in relation to folate, Dr. Brady’s does not. What he does recommend is that as your health improves, you may not need as much of these nutrients as you did initially and can lower your dosage. He also recommends dividing the doses of the B vitamins within the day. B vitamins are water soluble and will leave your body based on your hydration status (yep, that’s the Bs in bright yellow urine). We take sublingual B12 and folate when we wake up and after lunch. That seems to work well for us. I’ve heard some feel well dividing them into three doses. Most people don’t recommend taking them later in the evening because they are energizing and not conducive to sleep. Dr. Linus Pauling, two-time Nobel Prize winner, said you can trace every sickness, every disease, and every ailment to a mineral deficiency. Without minerals, amino acids and enzymes don`t work and so vitamins and other nutrients don`t get broken down and absorbed properly and we end up with major deficiencies in both vitamins and minerals. In relation to MTHFR, most approaches concur that a full combination of nutrients works much better than any two in isolation. Many are synergistic and don’t work at all without other cofactors. Methylation can’t even take place without a magnesium molecule. B6 is converted to its active form by zinc, so a zinc deficiency would make taking B6 useless. Vitamin B6 has been shown to improve the absorption of magnesium as well as other minerals into cells. Calcium works synergistically with vitamins D and K2 and may actually be harmful if not taken with K2. People are deficient in many vitamins and minerals due to a number of reasons and it may not simply be diet. The typical advice of eating five servings daily of fruits and vegetables is still the best, but it doesn’t buy you the nutrition that it did in the 1940s due to the nutrient depletion in the soil, the use of chemicals in farming, hormones in livestock and other factors. Most of these can be found in a good multivitamin/mineral supplement, but not all of them. Both Dr. Lynch and Dr. Yasko have multivitamin formulas, and they don’t cover all the bases. There are three particular deficiencies that deserve special mention: lithium, iodine and essential fatty acids. Most multivitamin/mineral supplements do not contain these important nutrients. Lithium can only be found in water that comes out of the ground, so that would be spring or mineral water and not bottled water labeled as purified or drinking water. Areas that have sufficient lithium in the drinking water have lower rates of crime, homicides, mental illness and suicides and higher rates of longevity (a good discussion can be found here). I can actually go to a spring that’s about a five minute drive away and get spring water right out of the ground (find a spring near you). Water with sufficient lithium would provide about 2mg/day. A safe daily low dose is considered 3-5mg. Lithium is neuroprotective, can help with mood, inhibits beta-amyloid secretion, and also prevents damage caused by beta-amyloid protein once it’s been formed and enhances nerve cell DNA replication. This is obviously beneficial in preventing Alzheimers. Lithium also helps to chelate or remove aluminum from the body. Hair mineral tests on family members, one 19 and one 75, showed they both had harmfully high levels of aluminum indicating that they were not able to detoxify this metal. As you may recall, one of the problems MTHFR creates is an inability to detoxify things like aluminum and other metals; thus, lithium may be beneficial for those of us with the defect. I found a mineral supplement with 4.5mg and both my daughter and I felt a positive effect on mood after taking it. This is far from the amount used in prescriptions for serious mental illness which is typically 300mg. Iodine is important for thyroid function, breast health, bone marrow, the immune system and mental health. A deficiency can cause weight gain, low energy, depression, cardiovascular disease, cognitive decline, and a variety of cancers. Most experts do not believe that the intake of iodine in iodized table salt is sufficient for good health. Selenium is synergistic with iodine helps the body absorb it. The Japanese have an average daily intake of 12.5mg from their high consumption of sea vegetables as well as fish. Consequently, the Japanese have rates of breast cancer that are 1/3 the incidence for US women. They also have a lower incidence of other types of cancer and heart disease. Iodine-deficient breast tissue also shows alterations in DNA and increases in estrogen receptor proteins. Women with fibrocystic breast disease (FBD) were given iodine in doses between 3 and 6mg and it reduced the symptoms of FBD significantly without side effects. Iodine also suppresses tumor growth and causes cancer cell death in breast cancer in cancer-prone rats, reducing tumor rates 2.5 fold. Although my local women’s hospital told me my risk was low for breast cancer about eight years ago, given that my sister was diagnosed with breast cancer at age 40, and I’ve had three stereotactic biopsies, a lumpectomy, a history of FBD along with estrogen exposure from decades of birth control plus being heterogenous C677T, I’m taking iodine. So I’m guessing when my doctor said there is nothing that can be done for FBD, I doubt she was considering possible beneficial integrative medicine approaches. Regarding essential fatty acids (EFAs) the Omega 6 to omega 3 ratio in the US is one of the most unhealthy in the world. The average ratio in the US is 15:1 but can be as bad as 50:1. The healthy ratio is 1:1 to 5:1. A healthy ratio will reduce the risk of breast cancer, and reduce the symptoms of arthritis, allergies, cardiovascular disease and depression among many other conditions. Elevated omega 6s contribute to all inflammatory diseases. Probably the worst offender food is omega 6 vegetable oils followed by processed foods. You can fix your ratio by decreasing the omega 6 foods and increasing the omega 3 foods like the oily fish in these recipes, certified pure fish oil supplements containing DHA and EPA, or other foods such as flax, walnuts, cauliflower, brussel sprouts, broccoli, squash and collards. In doing some research on this important ratio, I downloaded a not very user friendly tool called Kim. I tried to input my diet in numerous ways but could not get my ratio down even when eating salmon three times a day. But by adding 1 Tbl of flax oil, my ratio was in the optimal range. So 1 Tbl of flaxoil, preferably organic or ground flax seeds (which go great in oatmeal) is going to have a positive effect of your ratio of these essential oils. I think of EFAs as a brain lubricant and just as important to your brain as oil is in your car. Your brain is the fattest organ in your body, comprised of 60% fat, so make sure it gets enough good fats! For people with MTHFR defects, the minimum supplements recommended by the approaches reviewed here are folate, B12, B6, magnesium, Zinc and TMG. Due to the positive synergistic effect of all the vitamins and minerals on the B vitamins, the best approach would be to make sure you don’t have any deficiencies by taking a good multi, supplementing to improve your ratio of EFAs and consider supplementing iodine and lithium. Like the advice of Linus Pauling, avoiding these deficiencies would go a long way in avoiding most diseases and improving or resolving many adverse health conditions. Always add supplements one at a time slowly to assess your tolerance and remember that methylation is a critical metabolic process. Always check with your doctor or a qualified practitioner before starting any methylation related protocol. In 1992, my husband, 24 years my senior, was diagnosed with Hepatitis C. Hep C is a serious liver disease without a cure, so I explored alternative medicine. Now at 75, he is the poster child for transplants and health with Hep C, mostly because I became a self-navigating nutritionist, naturopath and now a budding nutrigenomist. In 2001, my son was diagnosed with Autism. Same thing, no cure, but I used supplements and nutrition; he’s in college making As and Bs. These two situations along with a parent with cancer caused me to do two decades of research on alternative therapies. I was often asked if I was in the medical field probably because I did my research to try and make sure that the doctors were doing a good job. I had problems for which I was prescribed medication, but the doctors, as usual, didn’t discuss what might be causing it. I determined I had a histamine intolerance problem, and in researching that for myself, I found that compromised methylation could be a cause. That led to MTHFR (I’m heterozygous for 677C). Once I did the research on it, as an engineer (M.S), I found the statistical prevalence of the defect and the risk of problems and diseases it causes or contributes to astounding. Everyone in my family as well as those in my extended family who have been tested have the defect and have many related conditions. And that’s how I arrived here. Hi I was wondering what Supplements should I be taking with MTHFR C677T and A1298C?? I can’t seem to fined out what I need to do. Im not eating Gluten and Folic Acid. Please Help. Hi Melissa – this article that you commented on gives good tips on some of the supplements. Unfortunately there is no “one size fits all” protocol for these mutations. It takes some investigation into all of the genes impacting the methylation cycle, and then tailoring to your body. Do you have a practitioner you can work with? Thank you so much for passing on your decades of research! This info is helping me and my family navigate the MTHFR gene mutation and all of the medical issues it causes in our family. Finding the best nutrition and supplements has been difficult and this information is helping us all understand what we can do for ourselves that most doctors will not delve into. THANK YOU, THANK YOU!!! Thank you for the information. It’s very interesting. I recently started taking HomocysteX Plus and my symptoms improved in a few days although I’m not still feeling good. Following Dr.Amy Yasko’s B12 table I shouldn’t be taking methylcobalamin. HomocysteX Plus has 50% of this type of B12. So I should be changing the type of B12. But what I dont’ understand is that the type of folate that I’m taking is Methyltestosterone so the fact that is Methyl shouldn’t mean that I can’t take it either??. Or the table only refers to B12 and the folate that you take is not important. If you have the MTHFR Gene defect you should be taking folate and not folic acid. The body is unable to process folic acid if you have the MTHFR Gene defect. If you can’t or shouldn’t use the methyl forms of B12 and Folate, you could try Hydroxycobalam B12 and Folinic Acid instead. I have had a very frustrating year of health related issues. I became post-meoposual, diagnosed with Late stage Lyme and also diagnosed with the MTHFR mutation gene. I was told to take Deplin, the dosage was to strong. The Dr also had me try EnLyte, also caused side effects of muscle aches, head aches and aggravation/agitation. I am now trying Vit B 12 Methylobalamin 1,000 mcg and folic acid 100 mcg. Will this dosage help with the mutation? I am extremely medicine sensitive. Taking DIM, Bio Body, VSL #3 probiotics, Micronized progesterone 50 MG capsule. Dr also wants me to start 0.01 of testosterone cream daily. also a glutathione detox. Any suggestions would be greatly appreciated! My doctor says I need the enzymes that come in L-methylfolate. I have a Pharmacogenomics report but nobody to sit down and explain it to me. My limited 20 minutes with my Psychiatrist is the one who looked over the report and discovered that I don’t have these enzymes. It was removed by the FDA from drug lists and my insurance will not cover this supplement. Living off disability income, I cannot afford the L-methylfolate. It was about $150 for one month supply. I’ve looked online to see if I can find it a little (or a lot) cheaper but how can I know that is the proper supplement I am needing? As far as I am aware, the l-methylfolate you find online is the same as the prescription. You just have to look at the milligrams or micrograms to see how much comes in one capsule. You don’t necessarily need as much as comes in the prescription. I think most insurance plans don’t cover the prescription because it is a vitamin. I would ask your psychiatrist if they have any samples of Deplin (L-Methylfolate). My son’s carrier provided us the sample as she advised us that the majority of insurance carriers do not pay for this drug. On the insert for this drug, there is a savings card which will allow you to get this medication for $58.00 per month through RX Direct. You can also find a coupon on Good Rx which will reduce the monthly amount; however, I am not sure if this is something that you would be able to use ongoing. Do you have a recommended brand that may contain all these needed nutrients or a combination of recommended products that will cover all needs mentioned in your article? I am new to this site and I have MTHR C667T and A1298C Heterozygous. I am going to have to the 23andme done. In the meantime I was wondering according to the b chart. Which one is best for me? Tammy, Did you find a solution for your sinus problem? I have gotten a lot figured out but the sinus headaches I get have been awful. Does anyone know if sinus infections/headaches are related to MTHFR? I read where someone had success with headaches using lecithin and am wondering if that works for sinus headaches too. Does anyone know if sinus infections and sinus headaches are part of MTHFR? I am compound hetro MTHFR. I think because we do not process toxins very well, we are at a higher risk for infection. For sinus headaches and chronic infections I would seek a doctor who can order a MARCoNS test for you. Also look into toxic mold exposure and other infections like Lyme, Epstein Barr Etc… I have tested positive for all of these. I am to start medications soon, and I am hoping to try BEG Spray. Feel free to write me. Sorry for the delayed reply. Even after a couple sinus reconstruction surgeries, I DO still get some swollen stuffy sinuses & often headaches with it. By listening to my local weather report, I know what is pollinating at the time and I’ve been able to determine what sets me off. Pig weed, rag weed and grass pollen in the fall of the year here in North Texas are the worst for me. So in that season, I take Zyrtec daily & if its really bad, I also use Flonase nasal spray once daily. And of course, I always buy the generic and apparently it works for everyone else in my area because the stores are always out. For the head aches, I have found that an Excedrin generic works best, but it has aspirin in it which really tears my stomach up, so I have to be careful with it. The caffeine in it dialates the small blood vessels and the aspirin thins the blood which works wonders for those headaches. It also has some acetaminophen in there. The recommended dose is 2 tablets, but with my aspirin sensitivity I just take one and maybe a regular acetaminophen with it. Of course, some times nothing seems to help so I thank you very much for sharing your little bit of info about lecithin, and I’m deffinately going to do some reading about that. I also have suffered from tension headaches in life, and I think for us poor folks with Fibro, attention is just part of it. I’ve also read that B deficiencies can cause these sorts of things because of the roll it plays with the nervous system. It’s hard to find good info, but I want to share this with everyone. I find the best info on Pintrist. Yes, Pintrist ! It usually gets shared and passed around by others who suffer from the same junk & just want for help each other out. Most of that info delves way deeper than a general doctor can do anyway. So please,,, look into it! I hope this helps somewhat, and thanks again for your bit of info. Not sure if Sinus headaches are from MTHFR but I am Homozygous for C677T and have had them for years. Someone mentioned Zinc Picolinate for these headaches in 1984 and it works very well. With food I take 50 mg several times per day for several days. Pyroluria was also mentioned in connection with MTHFR and for that problem I also take Zinc Picolinate, so yes maybe there is a connection. Thank you so much for your helpful information I appreciate your response. Thank you for providing such detailed info to help with those researching MTHFR issues. The Dr. Lynch recommended Optimal Multivitamin contains Magnesium Aspartate, online reading this is neurotoxic/excitotoxin and dangerous for those with depression and other conditions. Is this accurate about aspartate, do you have more info on the safety and benefits of this form of magnesium? What forms of magnesium would you recommend & why? From different sources I understand I would get more benefit from either Hydroxocobalamin or Adenosyl (B12). Now, I understand with these mutations I would NOT benefit from Methylfolate, is that allright? Is there any alternative to it? Luis, My understanding is that you MTHFR A1298A (from what you posted) is homozygous and not normal? You are literally an angel in my opinion. I can’t say thank you enough. In the past 5-ish years, I’ve been in the biggest battle of my life. My health had packed up and left! It started with a sinus infection that WOULD NOT go away with multiple doctors & multiple steroids, antibiotics & even 2 surgeries. I literally had to quit my job to focus on getting well. I was bed ridden & wasting away. Hair loss, muscle wasting,,, you name it. I have Fibromyalgia, Hashimotos, Rheynauds & a Lupus like condition. But, still no medications made me well or even slightly better. So I’ve taken it into my own hands & read, research & read some more. But the right info isn’t always easy to find. I did have a DNA test & have MTHFR 1298A>C AC. 677C>T CT but the doctor that ordered this year has never sat down & explained any of this to me. I don’t use him anymore, but I still don’t understand all this stuff and am struggling to find good info. Thank you for any help and this article. Will you please recommend an OBGYN in Arizona who is specialized in MTFR C677T? One question regarding the safety of B12 and folate. The article says the daily need for B12 will ranges between 10mcg and 1,500mcg, and the daily need for folate ranges between 200mcg and 2000mcg, depending on Homocysteine score. Circulating folate, vitamin B12, homocysteine, vitamin B12 transport proteins, and risk of prostate cancer: a case-control study, systematic review, and meta-analysis. I’m by no means an expert, but to me, increasing the intake of B vitamins in order to amplify their effect seems like a risky business, especially with regards to B12 and folate, given the above studies. Rather than increasing the intake, perhaps it is possible to optimize the pathway which doesn’t utilize B12/folate enough? So I’m hesitant to supplement B12 and folic acid (in any form) on a daily basis unless I somehow prove that my body is deficient in them. Increasing their intake might perhaps prove efficient moodwise, but I’m worried about the overall safety. Andrea, what is your opinion? Hi Jan – I think you might be confusing “folic acid”, which is what they reference in these studies, and the active forms of folate like methylfolate. I suspect the cancer incidence is due to a toxic response to the wrong forms (synthetic, not bioavailable) of these vitamins. Big difference – we talk a lot about this throughout this website. Thanks Andrea for a quick response. You’re right that the first study indeed references folic acid, but the second one specifically talks about folate. Yes, the toxicity of less bioavailable forms was what first came to my mind. Unfortunately, neither of the studies stated what form of B12 they used. However, since vitamin B12 supports cell-division, I would argue the main culprit is not the toxicity, but excessive cell division caused by high B12 blood levels. I guess I’ll do more research on your website. Just ordered a nice bottle of solgar’s B-50 complex a few days ago, but now I hesitate to use it. So what happens if I take too much Folate and B12? I have been taking 1.2 mg a day of each, but according to the numbers you have in this article I should be taking 400mcg folate and 500mcg b12. Can this cause an inbalance? Can this effect iron levels in the body? My iron keeps dropping and I am not sure if it is my MTHFR not being managed properly or if it is my Lyme Disease. Can you recommend a Dr who specializes in the MTHFR mutation. I live in Lafayette La. The Dr I see wants to give me Deplin in high dose. According to my research that isn’t a safe treatment. Thank you! I will look him up. I am compound hetero and can tolerate methylfolate but not methylcobalamin (get itchy behind neck). What B12 form should I take? From the chart towards the top of the page, I understood that we compound hetero MTHFR people can use any of the 3 B12s: MethylvB12, Hydroxy B12, and Adenosyl B12 but we should use less of the Methyl version. A lot of people are only looking at the MTHFR mutations but I’m finding that getting a complete report on all mutations or irregularities (not sure what the call them) sometime contradicts the MTHFR suggestions. For example: I have one gene that says to use Curcumin but another says to Avoid it. I am MTHFR Homo and I do best with the Andenosyl B12, but this is not just because of my one mutation. I have three other mutations that are a direct representation of B12 synthesis. A very helpful article and a good starting point for those who do not know how to approach their mutations. Thank you! Wow this is a lot to take in. Thankyou for taking the time to write this up. I had a moderate reaction to ciprofloxacin, previously I had always been overly anxious and very depleted in mood and energy, but never really thought anything of it. I did a lot of research and it turns out that people who tend to react to fluoroquinlones usually have an MTHFR mutation, so I had my homocysteine levels checked and it came back as 11. My mother had several miscarriages, my auntie needs B12 injections, that dont really seem to do much, uncle has psoriasis, my brother ulcerative colitis and so on throughout my family. Despite this, living in england, and the area that I do especially, the medical profession are pretty clueless about this genetic defect. Our labs here state that the normal range for homocysteine falls between 5 – 20, instead of 15, and I havent managed to find one doctor that knows anything about this condition, or any labs that actually test the methylation pathways asociated with MTHFR, COMT or MAOA. I have been supplementing with methylcobalamin and methylfolate and even thought its only been a week I am already noticing positive effects. My reaction to fluoroquinolones, also not recognised in the uk, has had a huge impact on my health and well being, caused me to lose friends who were convinced that since they couldnt see any obvious effects of what was going on, that I must be imagining my symptoms. I couldnt stand to be around them long and have essentially isolated myself. I ave been healing slowly, but still suffer in some way on a daily basis, all I want now is to find a way to definitively diagnose that this is a defect I posess, and if so, find the correct treatment at the correct dosage, to get back as much of what I have lost as I can. I am only 27, but I feel as though my life has been taken away from me. Even with all of this information presented here, I am so confused. Do you happen to know of any professional in the uk, to which this is a personal and professinal interest? I would resort to DIY gene testing, but I want something solid, and recognised. i dont know if I would personally trust the results of a post away spit test when it comes to something as important as my well being. Look up Cipro Toxicity and Magnesium. I’m dealing with the same thing. I have seen your post I can tell it is an old one, however, if you still didn’t don’t the right treatment , there is a doctor in Sydney that can help you just through a phone consultation. Simply to go their website and subscribe to their Skype/Telephone consultation and you should find the answers to all your quiries..
Before I was diagnosed with MTHFR I took medical grade supplements that included large doses of B6. I also noticed tingling in my toes. When my homocysteine tested high for the first time in 20 years monitoring, my doc tested my for MTHFR. I was homo for the C677T mutation. Also, say poz for two copies of C677T mutation (Quest Labs 11/11/15). I stopped all supplements with B6 and it slowly dropped from 136 to 54. The question no doc I have consulted and the web has no answer I can find is – is there any way to “flush” B6 from the muscles? I asked my doc about meds that deplete B6 like hydrocortisone and he vetoed that. Andrea — Your explanations are extremely helpful. Many thanks! I thought that regular folic acid was toxic to us? I thought you had to eat only green leafy veggies that contain L-5 MTHF, because we can’t process the Folic acid due to no Methyl group in it. That is correct, Cindy – I reviewed this article and did not find any mention of folic acid being recommended – so unsure where your comment is coming from? You may have been asked this already; where is the best link to help understand how to read the reports in regards to + and – . Is a — mean there is no gene found on that SNP for example?. Any suggestions for further reading for understanding would be warmly appreciated 🙂 (like what you have above under Dr Amy Yasko with COMT V158M – – ). Re Lithium oratate..not all people can tolerate it. I wondered why at low dose (1-2mg)..my children became almost manic, could not stop incessant talking. Hair sample showed they were more than deficient. Did some research and a few rare articles have seen similar effect on patients. And you wonder why some patients were not getting better. It effects the G6pd. Found my kids don’t have the main 2 forms but a new 3rd one is recognized by some. But being that there are about 400 g6pd,s I believe..I would assume everyone’s g6pd gets effected at times. Just a word of caution. After many years of supplementing B-complex, plus the P5P form of B6, I found out 11/2015 the likely reason for the four years (and even still now) the feet numbness/burning—B6 toxicity! Even though I stopped the B supplements several days before the lab draw, I was also over-range for B1, B2, and Folate. B6 is apparently stored in the muscle and is not as water soluble as we’ve been taught. Yes, I stopped all B-complex and P5P. Ideas/suggestions are more than welcomed. I am very interested in what others have to say. I have been struggling with nerve pain and tingling now for some time and am taking a lot of P5P due to COMT and MTHFR. Are you sure you needed a B supplement in first place? Heterozygous C677T shouldn’t cause any problems unless your body needs to detox a lot for some reason. Also the two MTRR mutations you’re homozygous shouldn’t cause any problem with a normal balances life. Thank you for the super helpful info! Is there a multivitamin that you use and recommend? I’m very happy to find your website. I”m heterozygous C677T AND A1298C. I’m interested to hear you believe you are histamine intolerant. I started on this journey because of chronic bouts of angio-edema which have lasted about 3 years now. (in the past it was never more than a couple of months). When I first started the MTHFR protocol, my edema did stop for about 9 months, but then came back despite not changing the protocol. I then found I am able to control the swelling if I maintain a very strict low salicylate diet, which is very difficult to do 100% of the time (very little fruit or veg, making everything from scratch, and so on). I did it all last year, but finally found an antihistamine I can take without any noticable side effects that controls the edema/ swelling symptoms enabling me to eat a more varied diet. Of course no doctor I’ve been able to find believes that there is any link between the swelling and the MTHFR mutation or the salicylates in food, including the #1 specialist in angio-edema who’s thankfully in my city. Not that he helped me much beyond finding me the right antihistamine. I’m wondering if you’ve had swelling and if you’ve found links between that symptom and MTHFR, histamine or salicylate intollerance. Hi Monta! Maybe late this answere, but I will tell you my story anyway. I also have the combined C677T and A1298C MTHFR variant. I also had oedema, but in my legs. I have read several people have some kind of oedema. I dont know if this is related to your problems, but I have an idea of what is going on. I started methylfolate and methylcobalamin i appr. (1:2 (400mcg:1000mcg)) ratio. The oedema got better, but some days it was back. And I soon got a feeling it could be something I ate. I have been grain free for almost a year, and eating lots of vegetables and foods what are known to be good for MTHFR mutants like us. Still not able to treat the oedema though. Then I read me up on the importanse of supporting methylation with cofactors., and found B6 to be one of them. Happily for me I startet with B6 and got hit with the oedema right away. The folate and cobalamin treatment suddenly also felt much better. Then I read myself up on the B6, and discovered that B6 binds to proteins for breakdown of those. I have read somewhere that too much proteins can make oedema. Most normaly in the lower part of the body. The idear here is that too little B6 when eating proteins (and methylation mutations) you could get oedema issues. Today I use B6 whenever oedema starts to come back. I then take 20mg of B6 with my meals (protein rich), and no oedema! Try it out, it might be an solution for you also. I know you posted this a long time ago but I hope you get this message still. Can you share which Antihistamine you found that gives you little side effects? I am having a histamine reaction but can’t find the cause yet. My dermatologist said to find an antihistamine and use if for a while to see if it helps but most of them dry my eyes and nose too much. If the antihistamine helps, then get food testing (it’s something I am eating) or try an elimination diet (it’s very hard at the beginning). I know Bananas and Avocados make my mouth burn but that’s it so far. Hi Lynn, sounds like you may have a food sensitivity to banana and avocado. You should be sure to get allergy testing to rule out allergy. Is that the histamine reaction you are speaking of, or is there some other kind of histamine reaction, like itching or swelling? The antihistamine that was recommended to me by the #1 specialist on angio-edema in the nation, was Allegra. You can get the generic version, Allerfex, at Costco for cheap, or other versions in any drug store. He said I could safely take 4x the labeled does. Labeled dose is one pill every 24 hours. Usually I just take twice that in two doses, one pill every 12 hours. If I eat too much of what I’m sensitive two (chanced strawberries this week and had reaction for first time in many months) I take two in the evening and one in the morning, or if it’s really bad, like my face is swelling, I’ll take two both morning and evening. Take note that I am NOT allergic to these foods. I have been tested and it doesn’t involve my immune system at all, making this a sensitivity rather than an allergy, and this swelling comes on slowly. Sometimes this is termed “false anaphalxis”, as well. It used to scare me to death, and I used to use an Epipen if my lips or tongue would start swelling. Now I just take 2 pills and swelling goes down quickly. This is NOT advice for someone who’s allergic. Unlike sensitivities allergies require emergency injection, as allergic reaction can kill a person in 30 minutes or less. Be sure to get tested for the things that itch or burn your mouth, or completely abstain from them. I should ad that I am no longer convinced that my MTHFR status has anything to do with my food sensitivity at all. It could, but there’s no reason to think that. The MTHFR protocol did nothing at all for the problem. It was a coincidence that I happened to start the protocol at the time of year when the fruits I’m most sensitive to went out of season. I was miraculously “cured” for about 9 months, and then when summer came along— bang, my symptoms came back. I’ve had very few problems all winter and now strawberries are back in season and boom– doubling up on my antihistamines again (and I think I’ll give the berries a miss). Stephen, as an anxiety sufferer, I too am finding the same thing. In addition to gobbling up histamine, I suspect that the EVOO enables us MTHFR C677T afflicted people to better process vitamins and minerals. Plus, it was recently discovered that EVOO boost brain function via a process called autophagy. In an attempt to do things naturally, I have found curcumin three times a day very effective in treating inflammation. It is very safe. Both applications are necessarry to have a full, current gentetic picture. I am VERY confused by your statement that “Dr. Lynch’s family of five all have different MTHFR defects, but he says none of them take more than 400mcg of folate per day. ” When I go to his website of the basic protocol the dosages are MUCH higher in the supplements he sells. First the Optimal Multivitamin has 400 mcg of methyl folate with 125 mcg of methyl B12. Then he adds that those who are homozygous need additional supplementation, with a slow advancement until you acheive tolerating the HomocysteX plus and states 2 to 3 capsules (ea capsule has 800 mcg of methylfolate and 1000 mcg of methyl B12) upon waking and 2 to 3 before Lunch. Lastly he recommends a “up to 4 tablets” of methyl B12 5000 mcg. This seems to suggest that one may need upto (as they can tolerate) 26,125 mcg of methyl B12 and 3600 mcg of methyl folate. What am I missing? I have since setteled on 2800 mcg of methylfolate and have seen the health benefits with a dramatic decrease in blood pressure. As far as methylB12, I use much less due to my FUT2 status (found on livewello) as a non-secretor increases the absorbtion of b12 naturally in my gut. thank you so much for this information – it was very helpful as i am being treated holistically and now i understand things better. I thought this was a great summary of information and helped me tie a number of loose ends together. Thanks!